Last year, Intel and Microsoft funded the establishment of a Universal Parallel Computing Research Center (UPCRC) at the University of Illinois at Urbana-Champaign with the goal of brining parallel computing applications to the mainstream. Researchers demonstrate an application in which attendees can participate in a tele-immersive 3D environment. Participants in two separate spaces engage and interact in a 3D virtual environment to complete tasks or play games such as Tele-Immersive Saber Fencing or Tele-Immersive Jump Rope . 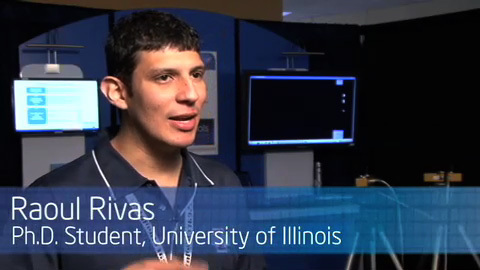 Raoul Rivas demonstrates at Research@Intel Day.